Spring may not yet have sprung, but it’s never too early to envision your garden in full bloom. Winter is the best time to plan your plant-filled outdoor space for the spring, summer and fall—which includes not only what plants you’ll be tending this year, but how you’ll get the most enjoyment from your labors. 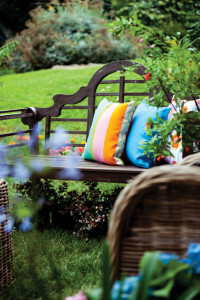 Incorporating a bench—the workhorse piece of furniture in any room, indoors or out—into your design will help you transform your garden into an interactive oasis for relaxation, discovery and even utility, year-round. Here, we’ll help you choose the perfect perch for your outdoor escape. 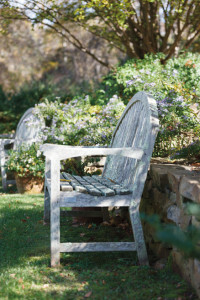 First things first: Identify where a bench may easily fit into your existing garden design, or consider where you might make landscape changes to incorporate one. Find the best views of your yard—water features, fountains and focal-point beds are obvious spots that benefit from a well-placed bench from which to admire their beauty. The base of a flowering tree, near a fragrant bush or next to long grasses are also great locations in which to sit a spell. 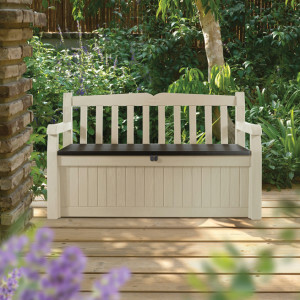 Other prime places for benches are along walkways and in the farthest reaches of your yard, beckoning visitors to meander all the way through and admire the sights and inhale the aromas of your landscape on the way to a respite spot. A bench can also bring an element of surprise and interest or blend seamlessly into the landscape when placed directly in a bed or around a quiet corner where visitors rarely go. Next, check the conditions of your potential bench location for ground dryness and for sun/shade patterns. Your ideal spot(s) should be free from runoff and post-rain-shower standing water, and should provide shade for at least part of the daylight hours in which you’ll be enjoying time there. Study sun/shade patterns in your prospective spot for a few days prior to placing your bench there permanently. 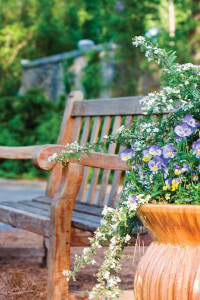 Consider additional roles your bench might play in your garden. A backless storage bench can hold tools, small pots, extra potting soil, gardening gloves or hoses. Two benches placed opposite each other can morph into an al fresco dining spot with the addition of a folding side table or two (and a tray of hors d’oeuvres). Similarly, a bench located just off a patio or larger gathering spot can double as a mini-buffet during outdoor parties. And a bench with a backrest and under-seat storage can stow children’s outdoor toys, towels, extra sunscreen and bug repellent, as well as serve as a drying spot for towels after a run through the sprinkler or dip in the pool. 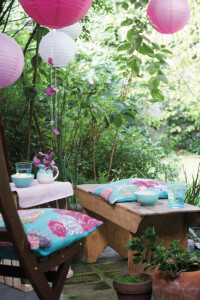 Bring in color and pattern to create a focal point with outdoor cushions and pillows arranged on a bench with a backrest that you can change up by the season, occasion or your mood. 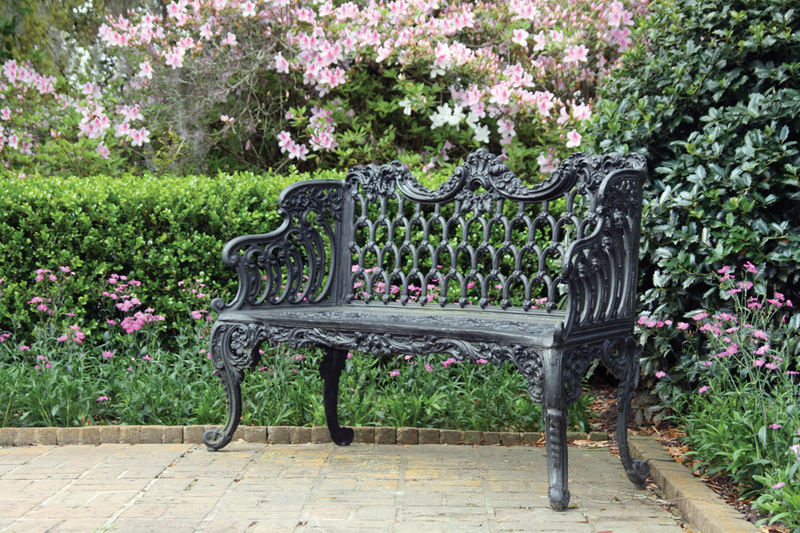 Iron, cast-aluminum and copper benches with backrests are often adorned with vine, floral or scroll patterns that can add interest to a bland area of your garden or can serve to draw the eye toward a specific plant or architectural feature you’d like to be noticed. Wood and manufactured-wood benches with backrests bring their own flair; traditional, camel-backed, Mission-style, even brightly painted versions mean the accent options for your landscape are endless. Once you’ve determined a location, style and any desired dual functionality, it’s time to go shopping for your bench (or benches!). Here are some common materials and their advantages out in the wilds of your garden. 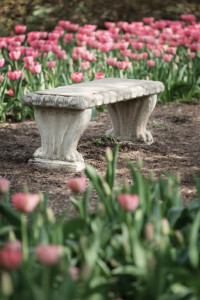 Adding a bench (or three) to your garden this year is a sure bet for countless hours of outdoor enjoyment among the blooms, be it in reflective solitude, in boisterous celebration or in a bit of both. Find the right one for your space and you—and your guests—will never want to come inside.